The award winners and NIDA staff (from left to right): Carol Krause, NIDA Public Information and Liaison Branch Chief; Dr. William Dewey, Chair, Friends of NIDA; Aakash Jain, Second-Place Winner; Lily Wei Lee, First-Place Winner; Dr. Nora D. Volkow, NIDA Director; Alexandra Ulmer, Third-Place Winner; Sarayu Caulfield, Third-Place Winner; Dr. Sheri Grabus, NIDA Press Officer. 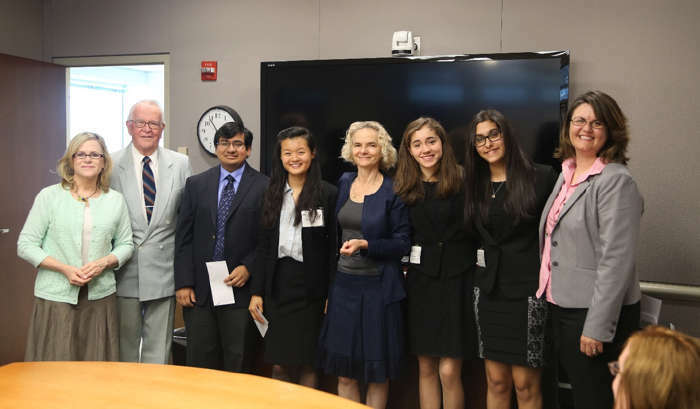 On June 30, the 2014 winners of NIDA’s Addiction Science Fair Awards presented their winning projects to NIDA Director Dr. Nora D. Volkow, Deputy Director Dr. Wilson Compton, officers of the Friends of NIDA organization, and other NIDA personnel at the Institute’s offices in Rockville, Maryland. NIDA judges had singled out the 4 high school student-scientists in March, from among 18,000 participants in the annual Intel International Science and Engineering Fair (ISEF), as having done distinguished work that is relevant to NIDA’s mission of bringing the power of science to bear on drug abuse and addiction. First-place winner Lily Wei Lee of New York City presented results from her study, “Assessment of Third-Hand Exposure to Nicotine From Electronic Cigarettes.” E-cigarettes are devices that simulate conventional cigarettes vaporizing nicotine-containing liquid. Third-hand exposure to nicotine occurs when individuals touch, ingest, or inhale residue from e-cigarettes that has collected on surfaces and clothing, even long after smoking has ceased. Ms. Lee’s timely study tested how nicotine vapor from different brands of e-cigarettes accumulates on various surfaces. Ms. Lee exposed metal, glass, and wood; vinyl wall; and tile floor to e-cigarette fumes inside a test chamber and used a wipe-sampling protocol followed by gas chromatography analysis of the wipes to test for nicotine deposition. While results were variable among the different e-cigarette brands, all brands deposited nicotine on the surfaces, with particularly high concentrations settling on the tile floor. Ms. Lee proposes to study the risks of third-hand nicotine exposure from e-cigarettes in the future. She will attend the City University of New York in the fall. Aakash Jain of Phoenix, Arizona, took second-place honors with his study, “Computational Analysis of the GABAA Receptor.” Past research has suggested a connection between the GABAA neuroreceptor and several neurological conditions, including Alzheimer’s disease, depression, epilepsy, and addiction. Mr. Jain used protein–ligand docking software to develop 3D models of the GABAA receptor. Protein–ligand docking is a molecular modeling technique that predicts the positions and orientations of ligands bound to protein receptors. This technique enables scientists to identify promising drug candidates for pharmaceutical research. Using his 3D models, Mr. Jain screened 2,500 compounds from a database for their potential to modulate the α1-β2 site of the GABAA receptor. He identified 8 drugs with potential clinical applications. Mr. Jain will attend Duke University in the fall. Third-place winners Sarayu Caulfield and Alexandra Ulmer of Portland, Oregon, presented “Capacity Limits of Working Memory: The Impact of Multitasking on Cognitive Control in the Adolescent Mind.” The two queried more than 400 adolescents about how often they consumed media while working. After categorizing each adolescent as a “High Media Multitasker” or “Low Media Multitasker,” the young researchers tested each one’s capacity to remember shapes, numbers, and letters on a computer screen with and without distractions, such as music and incoming email. Numerous studies demonstrate that adults’ cognitive performance decreases when they multitask. However, few studies have addressed whether multitasking affects the abilities of contemporary adolescents—“digital natives” who have lived, learned, socialized, and relaxed with computers and digital technology from an early age. The data that Ms. Caulfield and Ms. Ulmer amassed led to some striking conclusions, suggesting that the adolescents’ media-consumption habits influenced their ability to filter distractions and focus on a task. As expected, Low Media Multitaskers’ performance on the memory tests suffered in high-stimulus environments. However, High Media Multitaskers’ performance declined in low-stimulus environments. Ms. Caulfield and Ms. Ulmer will begin their final year of high school at Oregon Episcopal School this fall. Following the student-scientists’ presentations and responses from attending NIDA scientists, Dr. Volkow presented them with certificates recognizing their achievements, and Dr. William Dewey, Chair of the Friends of NIDA, presented scholarship awards. Afterwards, the winners toured the National Institutes of Health campus and met with research scientists in their laboratories. Watch video interviews with each of the winners. NIDA. "Student-Scientists Present Award-Winning Research at NIDA." National Institute on Drug Abuse, 20 Aug. 2014, https://www.drugabuse.gov/news-events/nida-notes/2014/08/student-scientists-present-award-winning-research-nida. NIDA. Student-Scientists Present Award-Winning Research at NIDA. National Institute on Drug Abuse website. https://www.drugabuse.gov/news-events/nida-notes/2014/08/student-scientists-present-award-winning-research-nida. August 20, 2014.